After graduating from art school, Lim worked for nine months at a jewellery company, but was soon disillusioned. “I was told to copy designs that were popular, and make jewellery from aluminium and rubber!” she said in mock horror. She decided she needed to look elsewhere. In 1993, she was introduced to stockbroking and thought it would be a good reality check. “It was like the school of life! You soon learn that everything is interconnected. Something someone says on the other side of the world will impact the market in Malaysia. An earthquake could derail the entire index, so can a hostile takeover. “You also learn that people are not what they seem, that when money comes into the picture, people change,” she says. For six years, she immersed herself in that world. In 2000, she decided to take a break. She picked up the paintbrush and started to re-connect with her creative side. For two years, she did nothing but paint. She produced around 30 paintings in that time – it was her Botanica series, a body of work showcasing her love for flowers. Around the time she started painting, a space came up for rent. It was to become her first gallery, but she didn’t know it then. She actually rented the space as her studio. So when her collection was completed, her husband told her to hold a show. Though nervous, she went ahead with it, and in 2002, held her first exhibition at her studio, Townhouse. She sold her first painting for RM2,000, and subsequently sold her entire collection. 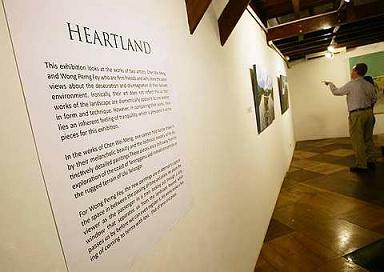 Art enthusiasts milling around Wei-Ling Gallery and appreciating the artworks of Chen and Wong in Heartland during the opening event. 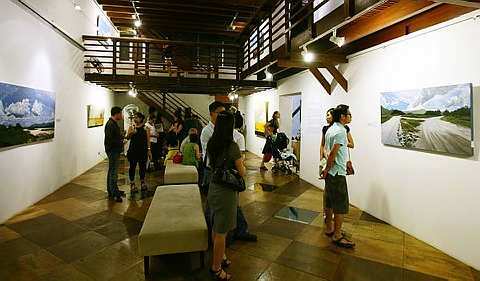 Artists started approaching her to show their work at Townhouse, and so she tentatively stepped onto the art scene. She renamed it Wei-Ling Gallery. “It was a struggle for me (to do that) at the time. I mean, how does one name a gallery after oneself?